The BTQ-SG8 PAVA secondary global unit is not only an extension unit for BTQ-VM4/8 PAVA controller but can also work independently without the BTQ-VM4/8. Up to 64 BTQ-VM4/8 or BTQ-SG8 can be networkable by full-redundancy-loop global-net via STP CAT5/6 cable (max. length 100m between units), multi-mode (2 km) or single-mode (20 km) fibre optic, even longer distance upon request. The BTQ-SG8 is capable of handling 1000W speaker load per zone and 2000W max. per unit. It extends the number of input and output contacts available in the system, including 9 monitored EVAC inputs triggered either by dry contact or relay, 8 logic control inputs and 8 relay control outputs (configured by web browser). The two digital interfaces can connect up to 8 paging consoles or remote units for each, and be wired in a daisy chain or redundant loop. 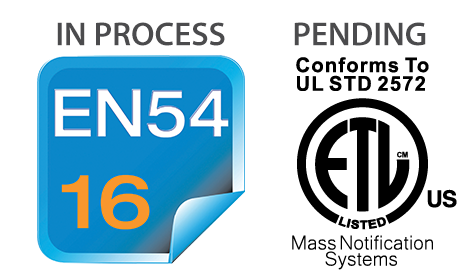 In accordance with EN54-16 and UL2572, all BOUTIQUE system components and peripherals are monitored from paging microphones to loudspeaker lines. The speaker lines are monitored for short, open circuit and leakage. Multiple volume attenuators can be installed on monitored speaker lines without loopback cable. The system can easily setup from the LCD panel of BTQ-VM4/8, the advanced settings can be accessed by web browser such as volume, PEQ, audio routing, monitor and control, event and bell scheduler, paging with priority management (1~99 priority level) etc.. In addition, the BOUTIQUE contains with fully digital audio mixing and a internal message and music storage for up to 90 minutes, and a USB interface to play G.711, G.722, G.726, G.727, MP3 and WAV files.